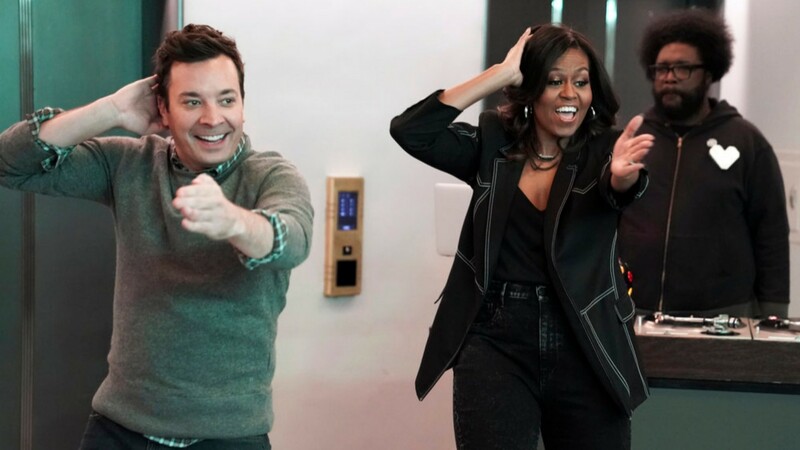 Even if you’re the type who doesn’t like surprises, you’ll love the one Jimmy Fallon and Michelle Obama pulled off for Tuesday night’s episode of Fallon’s Tonight Show. Currently on tour promoting her best-selling memoir, Becoming, Obama joined Fallon to give tour guests at New York’s 30 Rockefeller Center more than they bargained for in the best way. The gist of the fun prank was that an elevator carrying guests touring NBC would stop, seemingly at random, on the wrong floor. Waiting on the other side of the elevator doors would be none other than Fallon and Obama, doing everything from reading each other’s books to playing the piano and popping out of a gigantic gift box. Oh, and we’d be remiss not to mention the time Obama was jumping rope like a pro. Who knew our former FLOTUS had such skills? The looks on the faces of the tourists when they realized who the two people partaking in these shenanigans were should fill your heart with your daily quota of warm and fuzzies. It’s not surprising Obama has a bit of extra cheer to share this holiday season. Just this week, Penguin Random House — the publisher of Becoming — announced that her memoir has sold more than 3 million copies in the U.S. and Canada in all formats. That represents a spike of 1 million books since the previous report only two weeks prior. At this point, it seems like a foregone conclusion that Becoming will clinch the title of 2018’s best-selling book. Just today, it set the record for the best-selling Christmas book in the U.K. It doesn’t hurt that Obama is carrying major goodwill with her book tour, either. As she makes her way through the talk show circuit, we’re seeing a side of her we’ve never seen before: relaxed, funny and full of zingers. On The Late Show after their fun-surprise video, Fallon pulled up a photograph of Michelle and Barack Obama waving goodbye as they departed the White House on the then-president’s plane. When Fallon asked Obama to “walk me through” what she was thinking at that moment, Obama quipped, “Bye, Felicia!” This witty retort drew a big laugh from both Fallon and the audience and prompted Fallon to ask if that was really true. If this is what Obama out of the White House looks like, we are here for it. Although to be clear, we certainly wouldn’t complain if she wound up back there either.